MiniMed 670G becomes the first hybrid closed loop system officially approved for type 1 pediatric use; systems are available now. European approval also received for 7 years and up! The FDA has approved Medtronic’s MiniMed 670G hybrid closed loop and Guardian Sensor 3 CGM for use in children 7-13 years old. (For background on CGM, click here. )The automated insulin delivery system is now shipping for this expanded age group in the US, nearly two years after the initial approval for those 14 and older. Medtronic also announced European approval (CE Mark) for the MiniMed 670G in both adults and pediatrics (7 years and older). A launch is expected in ten European countries later this year: Belgium, Denmark, Finland, Ireland, Italy, Netherlands, Spain, Sweden, Switzerland, and the UK. The 670G, which uses CGM values every five minutes to adjust pump basal insulin delivery automatically, is a particularly exciting tool for children. In a three-month trial reported in February, the 670G reduced A1C by 0.4%, improved time-in-range (71-180 mg/dl) by two hours per day, and reduced hypoglycemia by 24 minutes per day. The improvement was especially strong overnight, a big win for easing parents’ worries. See the FAQ below for details on how the system works. Like the adult version, the MiniMed 670G includes the Guardian Sensor 3 CGM, which requires at least two fingerstick (blood glucose meter) calibrations per day; four are recommended and are usually needed. For parents, it is important to know that the 670G does not currently enable remote monitoring – CGM values can only be viewed on the pump screen. 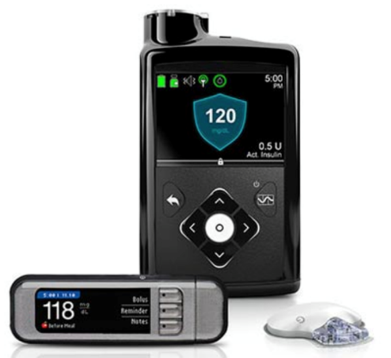 Medtronic hopes to launch a Bluetooth-enabled 670G system within two years, which will likely add the ability to view glucose and pump information remotely. A 3-month study of the 670G is currently underway for users 2-6 years old, which would expand the age indication further. The only other automated insulin delivery system approved in the US is Tandem’s Basal-IQ with Dexcom’s G6. Approved for patients 6 years and older, Basal-IQ will launch in August and offer predictive low glucose suspend; in essence, the hypoglycemia-reducing portion of a hybrid closed loop. Tandem plans to launch its full hybrid closed loop in the first half of next year. What is the MiniMed 670G? The MiniMed 670G consists of an insulin pump (with tubing), a continuous glucose monitoring (CGM) sensor inserted under the skin, and a transmitter worn on the body. When the 670G is operating in “Auto Mode,” it receives a glucose value from the CGM every five minutes and uses it to automatically adjust basal insulin delivery, targeting a level of 120 mg/dl. If glucose starts trending high, the system may deliver more basal insulin to prevent/limit high blood sugars. If glucose starts going low, it may deliver less basal insulin to prevent/limit hypoglycemia. The system does not give boluses; see below. The target can be temporarily raised to 150 mg/dl during physical activity, and the algorithm adapts over time as conditions change and it learns patterns – for instance, it may deliver more insulin during times of sickness, or less insulin during a week of high activity. Unlike other systems that leverage a smartphone, the 670G is fully operated on the pump itself. Users only need to wear the Guardian CGM sensor and the MiniMed 670G pump – no need to carry a separate CGM receiver or phone. What is a “hybrid closed loop?” Does it take care of everything? What if I miss a meal or correction bolus? The 670G is considered a “hybrid closed loop” system because it is not fully automated – it still requires manual food and correction insulin boluses, as it only automates basal insulin. Still, this means the 670G will take care of insulin dosing in the background (on top of boluses), which is particularly valuable at night (often over 80% time-in-range from study data), and can help mitigate many highs and lows during the day. Food boluses will also benefit from an automated system that works between meals. For example, if a user took too much or too little insulin for a meal, the system might reduce or increase insulin delivery to keep glucose in range. It’s important to note that the MiniMed 670G will NOT give automatic correction boluses based on high CGM readings. This means that if a meal bolus is completely missed, glucose will still go high. The 670G will increase basal insulin in response to the high – up to a certain point – to bring blood sugar down, but it won’t give a large automatic correction bolus at one time on its own (future systems will add that). The system will alert the user to a significant high glucose number, ask for a fingerstick, and then prompt a manual correction bolus. In terms of safety, what will happen if my sensor fails or is inaccurate while I’m wearing the 670G? The system will revert to open loop (“normal” pumping) using pre-programmed basal rates. Insurance companies will typically cover a new insulin pump for someone with type 1 diabetes once every four years. Out-of-pocket costs vary by plan, though users typically have to pay some percentage upfront for the pump, CGM starter kit, and initial supplies. Medtronic has a program to spread out the initial cost of the system over 48 months, which comes to “as low as $1/day.” Even those with insurance coverage might need to pay over $1,000 upfront to get on the 670G, since the full retail price is approximately $8,000. This program is available to anyone, regardless of financial status. Additionally, there is a Financial Assistance Program that offers coverage for the following situations: unemployment within the last 12 months, gap in insurance coverage because of a pre-existing condition, multiple pumpers in one household, or a permanent disability.